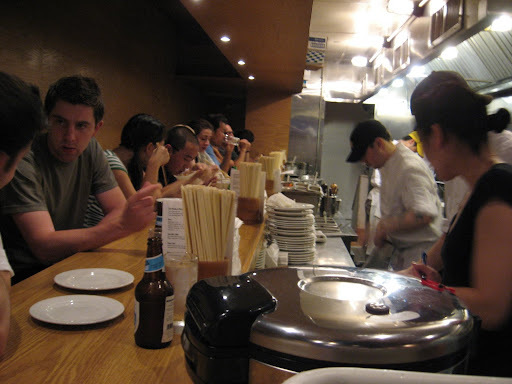 Our second stop on the NYC Memorial Day food tour was at Momofuku Noodle Bar. The Astronomer, Miho, and I managed to save enough room to share a bowl of pork ramen even after some hefty appetizers at Dumpling House. Regrettably, our appetites weren’t sufficient enough to order the Berkshire Pork Buns, but they are definitely one of my favorite menu items. 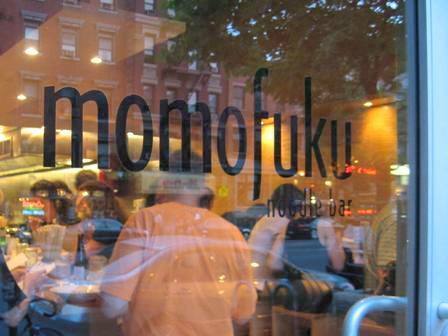 My brother introduced me to Momofuku over a year ago and I try to return whenever I’m in the city for work or play. The noodle bar is literally the the size of a shoe box and is almost always packed during peak dining hours. I was expecting a ridiculous wait for a table since Momofuku’s chef and owner David Chang recently won the 2007 Rising Chef Award from the James Beard Foundation. I was pleasantly surprised when we were seated only after three minutes of idleness. One bowl of pork ramen was the perfect portion for the three of us after our Dumpling House binge. Although we felt a little strange ordering a single bowl of ramen, our waiter was totally cool with our request to share (unlike the folks at Peter Luger—details to come). Authenticity aside, the pork ramen is a brilliant creation. The long strands of noodles are perfectly al dente even when dunked in the steaming savory broth. The Astronomer and Miho both commented that the broth was most excellent, but I found it a tad too salty. 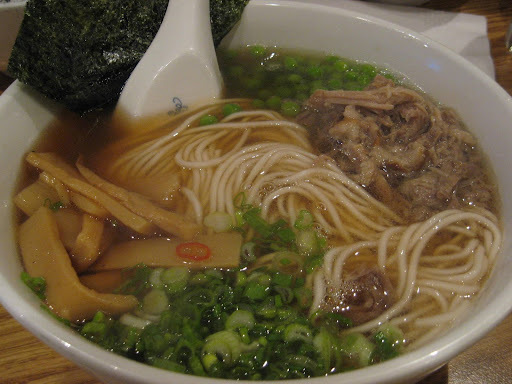 The bamboo shoots, fresh peas, and scallions go wonderfully with the ramen and provide both texture and freshness to the dish. The shredded Berkshire pork, though noticeably fatty, is my favorite element for its unrivaled flavor. I bet it’s not *literally* the size of a shoebox.